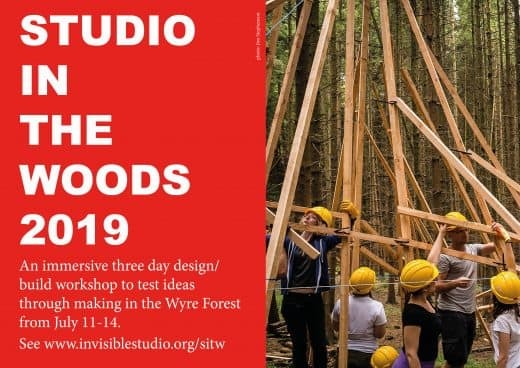 Studio in the Woods is back for 2019! The original ‘making’ workshop that was established in 2006 and the inspiration for many hands-on workshops since, returns this year. The workshop is open to all – architects, students and any other interested participants. A gallery of previous years Studio in the Woods is HERE. The workshop will begin at 16.00pm on 11th July, and finish at 2.00pm on 14th July 2019. It is being held in the Wyre Forest, a 150 acre woodland in Worcestershire. You will need to arrange your own transport to the event. Free camping on site. We will provide Lunch, Dinner, and all materials. You will be responsible for organising your own Breakfast. Further details will be sent out on registration.